A decade ago, the Institute of Medicine released a comprehensive report about racial and ethnic disparities in U.S. health care, suggesting that “clinical uncertainty” on the part of health-care providers treating patients from an unfamiliar background could lead to lower quality care. Training providers how to communicate with and care for these patients—a skill now known as cultural competency—was one proposed solution. 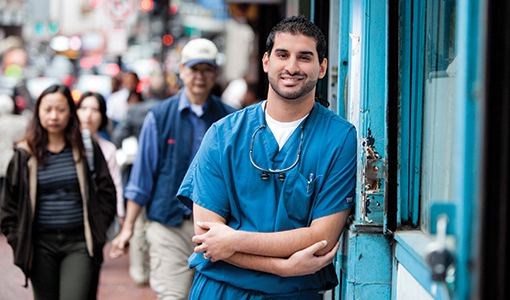 But dentistry trails far behind medicine in cultural competency training, says Yusuf Bhatti, D14, who assessed state licensing board policies for dentists and physicians. The research, which Bhatti presented at the 2012 annual meeting of the American Association for Dental Research, found that no state dental board required continuing education courses in cultural competency, and only two states, New Jersey and California, granted CE credit for such training. By comparison, three states require cultural competency training for physicians, and all 50 states award physicians CE credit for cultural competency courses. “At the practice level, even if you wanted to pursue [cultural competency training], there’s not any incentive, and there are hurdles to getting CE credit approved by state boards,” says Bhatti. When he looked at the racial makeup of physicians and dentists practicing in each state, Bhatti found that minorities were underrepresented in both professions, though more dramatically so among dentists. To Bhatti, that’s all the more reason to emphasize cultural competency training for practicing dentists. Tufts School of Dental Medicine has taken on that challenge, offering a series of six seminars on cultural competency to faculty on topics ranging from cross-cultural health communication to poverty’s relationship to oral health disparities. “The series is really formalizing what people have developed over the last decade,” says Robert Kasberg, associate dean of admissions and student affairs, who developed the program with Yun Saksena, DI00, associate clinical professor of prosthodontics and operative dentistry. Kasberg plans to launch a similar series for students next year, while a school advisory group will take steps to infuse cultural competency into the dental curriculum. In the United States, six dental schools offer a specific course in cultural competency; however, just one school makes the course a requirement, according to a 2006 survey of 34 dental schools published by the American Dental Education Association. But squeezing another requirement into the already jam-packed dental curriculum is not necessarily the goal at Tufts. “I’d much rather see it integrated throughout the curriculum and make it part of Tufts’ culture,” says Kasberg. Jacqueline Mitchell, a senior health sciences writer in Tufts Office of Publications, can be reached at jacqueline.mitchell@tufts.edu.